Defence Minister Nirmala Sitharaman on Tuesday complimented the Army for its professionalism in handling the Doklam standoff and other challenges such as containing insurgency in the northeastern region. In an address to the top commanders of the Army, she said enhancing capacity of the Army was a major focus of the government and promised close monitoring of improving strategic infrastructure. 'She conveyed admiration of the nation for the professionalism of the Indian Army during events like Doklam standoff, response to natural disasters and keeping the situation of insurgency in the North East states fairly under control,' the Army said in a statement. On the second day of the week-long commanders conference, the top brass of the Army deliberated on a broad range of operational issues, including security challenges along the borders with China and Pakistan. 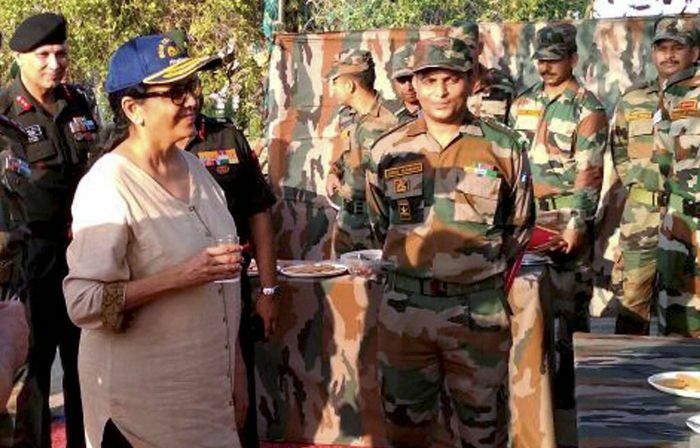 In her around half-an-hour-long address, the defence minister also referred to her visits to the forward areas and called the meeting with the troops as 'eye-opening'. Sitharaman said keeping morale of forces at the highest level was among the priorities of the government. Welcoming Sitharaman, Army Chief Gen Bipin Rawat told the commanders about the extensive travel undertaken by her to forward posts including Siachen. 'He also expressed pleasure on the fact that Sitharaman had already travelled extensively in border areas of the North-East and also across the border in Tibet,' the Army statement said. When asked about Rawat's comment about her visit across the border to Tibet, an Army spokesperson later said Sitharaman has extensively travelled in Tibet before taking over as defence minister and the reference was about that. Sitharaman had visited various forward areas along the Sino-India border, including Nathu La in Sikkim, on Saturday. The defence minister said modernisation of the Army was a priority for the government and that all the 'deficiencies' will be addressed to strengthen its combat capability. Sitharaman also assured the Army commanders that all service related matters will be resolved. In this regard, she talked about long pending force modification requests, welfare of serving army men and their families. Listing her top priorities, Sitharaman said integration of the armed forces was essential particularly in the domain of training, communication, logistics and cyberspace for preparation for any future conflict. 'She called upon Indian Army to continue leveraging its strength in diplomatic defence cooperation with neighbourhood and in the region,' the Army said. The Northern Command, the Central Command and the Western Command made presentations today on a range of issues having a bearing on the field formations of the Army. In its presentation, the Northern Command highlighted the security situation in Jammu and Kashmir. Meanwhile, Sitharaman said on Tuesday that lack of timely decision making in the last decade resulted in gaps in the Indian Air Force and the government is committed to fill them. In an address at the bi-annual conference of IAF commanders, the defence minister Sitharaman also said that the budgetary allocations should not be viewed as a constraint and should be looked at to acquire what is 'absolutely necessary', the IAF said. Inaugurating the three-day conference, she also said that the powers given to the service chiefs should be 'fully utilised' in achieving required capabilities of the forces. 'She said that the government is committed to fill the gaps which have arisen due to lack of timely decision making in the last decade,' the IAF said in a statement. Currently, the IAF has 33 fighter squadrons against the authorised strength of 42 squadrons. The IAF has been pressing the government to expedite acquisition of combat jets to overcome the shortage. The IAF is likely to start the process later month to acquire a fleet of single engine fighter jets which are expected to significantly enhance its overall strike capability. It is also looking at procuring various other platforms and weapons systems. The IAF commanders conference is taking place amid an evolving regional security scenario and growing assertiveness by China in some parts of the Sino-India border. Last week, Chief of Air Staff Air Chief Marshal B S Dhanoa had said the IAF is capable of effectively countering any threat from China and Pakistan simultaneously in a two-front war. Sitharaman said the IAF along with the Defence Research and Development Organisation (DRDO) and the Ordnance Factory Board, a state-run defence equipment maker, should make an assessment about the possible areas of indigenisation under the 'Make-in-India' programme. In his address, Air Chief Marshal Dhanoa emphasised the need for continuous effort and training to maintain IAF's air power, and called for continuing the process to enhance capability of the force. He also reiterated the IAF's role as the first responder in most contingencies and thus the need to sustain the ongoing process of capability enhancement making use of the government's thrust on the 'Make-in-India' initiative. The IAF said the conference will deliberate on a raft of issues which will decide the future trajectory of the force. It said deliberations will take place on operations and maintenance issues. Various administrative initiatives were also expected to be taken at the conclave to enhance the working environment of the IAF. In sync with the government's digital India initiative, two mobile applications for Air Force Cellular Network (AFCEL) phones will also be released during the conference, the IAF said. A book titled 'Aero India-Ascent through the ages' was also scheduled to be released during the conference.